"Crime is common, logic is rare"
"Discovering Sherlock Holmes." An educational site from Stanford U, contains short articles about Doyle and the historical setting, and downloadable copies of many Sherlock Holmes stories. Two recent biographies of Arthur Conan Doyle published since the release of his private letters, are reviewed in The Independent (UK). Conan Doyle , by Andrew Lycett and Arthur Conan Doyle: A Life in Letters , ed. John Lellenberg, Daniel Stashower & Charles Foley. 2 Nov. 2007. "Sir Arthur Conan Doyle." An introduction to Sir Arthur Conan Doyle from the BBC, which includes links to articles on British crime. "Sherlock Holmes: Teaching English Through Detective Fiction," by Pamela J. Greene. Yale-New Haven Teachers Institute. "Arthur Conan Doyle." Literary Encyclopedia. Eds. Robert Clark, Emory Elliott, Janet Todd. An introduction to Arthur Conan Doyle, from a database that provides signed literary criticism by experts in their field, and is available to individuals for a reasonably-priced subscription [subscription service]. Berdan, Marshall S. "Haji Holmes or You, Too, Have Been in Afghanistan, We Perceive." The Baker Street Journal 52. Calamai, Peter. "It's Their Birthday Too--Yeah." Historical events in 1854, the year of Holmes's birth. The Baker Street Journal 53. Calamai, Peter. "Despatches from the Moor: Newspapers and The Hound of the Baskervilles ." The Baker Street Journal 51. Cooke, Catherine. "Mrs. Hudson: A Legend in Her Own Lodging House." The Baker Street Journal 55. Curtis, Donald E. "The Lion's Mane": a Topical Review. The Baker Street Journal 56. Dahlinger, S.E. "Some Observations upon the Segregation of the Bea (sic)." On "Shoscombe Old Place," the last of the cases of Sherlock Holmes reported by Dr. Watson. The Baker Street Journal 56. Fetherston, Sonia. "Shoscombe Through the Looking Glass." On the possible influence of Lewis Carroll on "Shoscombe Old Place." The Baker Street Journal 56. Hill, Gideon. "The Richest Man in Horseracing." On "Silver Blaze." The Baker Street Journal 55. Hyder, William. "Holmes's Busy Day" ["Beryl Coronet"]. The Baker Street Journal 51. Jensen, Jens Byskov. "A Murder Was Committed - But Where?" On "The Bruce-Partington Plans." The Baker Street Journal 54. Jensen, Jens Byskov "The Avant-Garde Sherlock Holmes." The Baker Street Journal 53. Klinger, Leslie S. "What Do We Really Know About Sherlock Holmes and John H. Watson?" The Baker Street Journal 54. Klinger, Leslie S. A review of The New Annotated Sherlock Holmes Volumes I & II (Norton 2004). Reviewed by Brendan Wolfe in January magazine. Merrill, David W. "Home, James" - A Case of Domestic Identity. On "The Man with the Twisted Lip." The Baker Street Journal 53. Meyer, Nicholas. "Seven Per-Cent at 30: Memories and Reflections." Meyer's reflections 30 years after the publication of his The Seven-Per-Cent Solution . The Baker Street Journal 54. Moss, Robert A. "Old Frankland: A Case of Identity." [ Hound of the Baskervilles ] The Baker Street Journal 52. Nydell, Margaret. "Sherlock Holmes in Khartoum." The Baker Street Journal 51. Radford, John. "Dr. Watson to 1878." The Baker Street Journal 55. Redmond Christopher. "A Study in Sin: Religious Hypocrisy and Fanatacism in (and out of) A Study in Scarlet ." The Baker Street Journal 54. Roden, Barbara. "The Coming of the Fairies: An alternative view of the episode of The Cottingley Fairies." Sherlock Holmes Detective Magazine. Roden, Christopher. Arthur Conan Doyle: A Brief Biographical Study. The Arthur Conan Doyle Society. Roden, Christopher. "In Conversation With Dame Jean Conan Doyle." The daughter of Arthur Conan Doyle, the 84-year-old Dame Jean Conan Doyle, talks about her father. The Arthur Conan Doyle Society. Roosevelt, Tweed. "My First Meeting with Sherlock Holmes." The Baker Street Journal 52. Ross, Michael. "Footprints of a Gigantic Hund ." On the reception of The Hound of the Baskervilles in Germany. The Baker Street Journal 53. Sausman, Justin. Conan Doyle: Private Letters. English Literature in Transition, 1880-1920 53 (2010). [First page of article only.]. Shreffler, Philip A. "Watson's Weird Tales: Horror in the Sherlockian Canon." The Baker Street Journal 56. Solberg, Andrew. "Sherlock Holmes: Anti-Semite?" The Baker Street Journal 51. Stock, Randall. "The Trail of the Semi-Solitary Manuscript." On the manuscript of "The Solitary Cyclist." The Baker Street Journal 55. An informative online exhibit on Sir Arthur Conan Doyle's career and writings, from the City of Westminster Libraries. 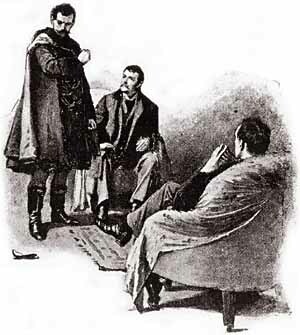 An extensive web site on Sherlock Holmes by Sherlockian Chris Redmond. The Baker Street Journal : An Irregular Quarterly of Sherlockiana, generously publishes a sampling of its articles online [indexed here]. "The Official Web Site of the Sir Arthur Conan Doyle Literary Estate," includes introductory articles on Doyle's works. Also provides a primary bibliography which covers Doyle's Sherlock Holmes fiction, Professor Challenger stories, Plays, Pamphlets, other Fiction, Verse, Works on War and the Army, Fairies, the Occult and Spiritualism. Web site of The Sherlock Holmes Society of London. "A literary and social Society, publishing a scholarly Journal and occasional papers, and holding meetings, dinners and excursions." Newspaper account and photo of Arthur Conan Doyle in Argonne during the first world war, from "The Great War in a Different Light." "The Sherlockian Who's Who." Information on 177 Sherlock Holmes Societies around the world and the Sherlockians who belong to them. Klinger, Leslie S. "Sifting the Writings upon the Writings." Recommended primary and critical resources for the Sherlock Holmes canon from the author of The New Annotated Sherlock Holmes . The Baker Street Journal 52.